Fifty-five thousand teachers on temporary contracts took to the streets on Rabat on Saturday 23 March. The National Contract Teachers’ Coordination Committee mobilised the protest order to demand an end to casualisation and the transfer of all teachers to a secure and permanent status as employees of the Ministry of Education. The teachers’ demonstration followed other long struggles, the most important of which was the strike of 4 February which culminated in the organisation of a mass march on the capital Rabat as the Moroccan people marked the anniversary of the beginning of their popular democratic movement on 20 February 2011. Around 240,000 teachers work in the national education system in Morocco, of whom around 55,000 are employed on insecure and unfavourable contracts. Moroccan officials are afraid of increasing numbers employed the education sector and a rise in the wage bill, which is used as a long-standing justification for keeping teachers on temporary contracts and for the privatisation of public services. During the protest, teachers raised slogans against the system of casualised contracts which links them to “regional educational and training academies”. They demanded integration into the national education system alongside their colleagues, in order to ensure professional stability and social and health insurance cover. They also expressed their rejection of all the neoliberal policies undermining free secondary and higher education and the privatisation of public schools. Their campaign takes place against the backdrop of a draft law currently being debated by Parliament which provides for family contributions to the cost of education. They also demanded the resignation of the Minister of Education and an end to IMF dictates in the public sector. Contract teachers have resisted the authorities’ attempts to stop their movement growing, such as such as salary deductions and threats to sack them or terminate temporary contracts. Officials have questioned the legitimacy of their demands and accused them of serving the interests of the radical political opposition. Finally, the Moroccan authorities resorted to violence against protesting teachers on the night of 23 March during the sit-in outside the parliament building, using water cannons in order to disperse protesters, they also charged the sit-in several times. This resulted in injuries of varying degrees of severity and the hospitalisation of around 60 teachers for treatment to fractures and eye injuries, giving the lie to the claim by the authorities that they only used water cannons to disperse the protest without resorting to violence. 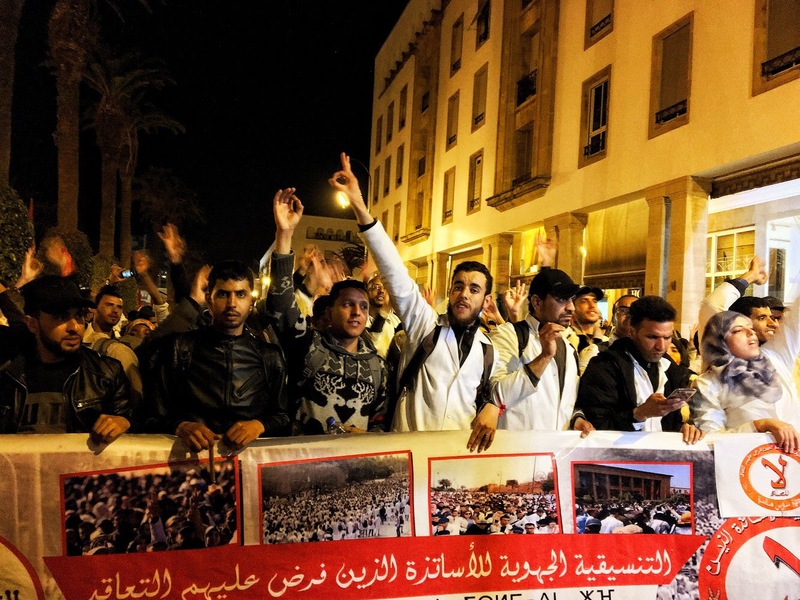 Despite this horrendous repression, teachers insisted on continuing their sit-in and sleeping in the streets and squares of Rabat to participate on the following morning in a national rally called by a coalition of political, trade union and human rights organisations. It is worth mentioning that the National Contract Teachers’ Coordination Committee is an independent, self-governing, mobilising body. It depends on local coordination committees in different cities to mobilise, and regional coordinating bodies in Morocco’s twelve regions. It is able to call mobilisations, and coordinate demands and a programme, to elect delegates to run media committees, negotiating committees and other committees, through free, democratic and collective discussion. The national leadership is made up of representatives from the regional coordinating committees. Teachers were quick to respond to the terrible repression of their peaceful sit-in, as the National Contract Teachers’ Coordination Committee announced a strike by teachers forced onto temporary contracts for six days from 25 March, alongside regional sit-ins. This escalation has met with great support from the trade unions following the rejection of the Minister of Education’s proposals to keep the contract system by the strongest five trade unions in the education sector in a meeting with the Minister on Sunday 24 March, and their declaration of support for the teachers’ struggle, and calling workers in the educational sector to strike for 3 days from 25 March. The Minister of the Interior has invited the leaders of the four most representative trade union federations (the Moroccan Workers’ Federation, Democratic Confederation of Labour, the General Union of Moroccan Workers and the National Union of Labour in Morocco) to a new round of social negotiations, starting on 26 March. The government has been manoeuvring for the past eight years in an attempt to deal with the demands of the unions for a general increase in wages, and the reversal of policies which attack civil servants’ pensions and trade union freedoms. At a time when public opinion and human rights organisations have denounced the repression of the teachers’ sit-ins in the early hours of 24 March, Minister of State for Human Rights, Mustafa al-Ramid, who is also a leader of the Justice and Development Party, said “The authorities have the right to break up the sit-in according to the law.” He claims that the law on public freedoms does not grant any legal recognition to “sit-ins” as a form of protest, exposing the false claims of the regime about the existence of human rights and democracy in Morocco. Send a message of solidarity to striking teachers and education workers in Morocco. Post onto our Facebook page or copy @MENASolidarity on Twitter and we’ll pass it on.